At first glance, Lord Roland Wilde a/k/a North and his fiancée, Miss Diana Belgrave seemed the perfect couple but a look beneath the shiny exterior would have revealed something very different. Neither put forth the effort to look beyond the surface presented by the other or to dig too deeply when Diana ran from her own betrothal party. Is it any wonder they didn't make it to the altar? The North who returns from war in the colonies two years later is vastly different from the man who left believing he had been betrayed by Diana, a woman he hasn't quite been able to forget. He's a man haunted by war, unable to sleep, searching for peace. What he finds is his former fiancée working at his family home as a (rather inept) governess for his youngest sister and the young boy society believes is his but this Diana is nothing like the demure fashionista to whom he was betrothed. Living in close proximity to one who chose to run away rather than become his duchess is an upheaval he doesn't need. Or maybe, this new Diana is exactly what he needs. Diana had a very good reason for her actions two years ago but those actions steered her onto a path that no one could have foreseen. Who would have thought the young woman destined to be a duchess would now be working as a governess for the same family of which she would have been a member? And, more amazingly, who would have imagined that she would be happier than she ever could have been as a duchess; happy, independent, and free to be herself, with no expectations of society hanging over her or watching her every move. Only one thing threatened that happiness: the return of North. I love this couple. I love the entire Wilde family. In fact, not since Julia Quinn's Bridgertons have I fallen in love with a family so quickly or completely. I've read Diana and North's story twice and already I'm eager to go back to the first page and begin again. They're just so darn good together...even when they're both certain they'll never be together. The sheer yearning in those moments had my heart clutching and my hand reaching for the tissues. I also love the humor in this story (and there is plenty), the witty banter, the sparks that fly when North and Diana go toe to toe, and the sweetness that flows between them in the quiet moments of the darkest hours of the night. I enjoyed their growth, both individually and as a couple, a process that enabled them to better understand - and accept - one another as well as their own strengths and weaknesses. I was in their corner, cheering for a happy ending, though I had no idea how James would pull it off. In the end, the solution, so simple, really, and from such an unexpected source, was perfection. Though I'm no fan of roller coasters (the real ones), this book coaster, filled with peaks and valleys, laughter and heartache, love and acceptance, is well worth the ride. If you're in the mood for a feel-good romance that will tickle your funny bone, carry you through a range of emotions, and, ultimately, wrap you up in a warm, loving hug, look no further than Too Wilde to Wed.
Who is your favorite romance family? 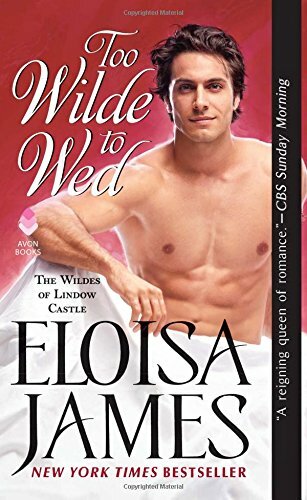 Are you reading the Wildes of Lindow Castle series? This wonderful review shows me that I have been right in eagerly awaiting this book! Favorite romance families: JQ's Bridgertons, Julie Ann Long's Everseas and Redmonds, Kristan Higgins' Hollands, and Nora Roberts' Montgomerys, Stanislaskis, and Gallaghers, plus quite a few more. All of those families would be on my favorites list, Cheryl. I am a fan of Julia Quinn's Bridgerton family, and Mary Balogh's Bedwyn Family and the newer Westcott family. I really enjoy series which show the reader families who are complicated, and fun and caring. I would love to be able to go to KissCon in October, but alas, that is not to be. Thanks for this lovely review. PJ, I really hope to be able to go to KissCon! I've quite a few family favorites, The Huxtables, The Hathaways, The Cynsters, The Bridgertons, The Mackenzies, etc. Way too many to mention. I did read the first book in this series, and I have this one on my ever growing "wish list". Thanks always for a great review P.J. Hope you enjoy this second book as much as I did! What a wonderful review! I cannot wait to read it! Love her books with all my heart! Thank you for the chance! You're welcome, Cherie. Good luck! I love the Cysnsters & the MacKenzies - haven't read this one of Eloisa's, but I've read lots of her earlier books. I love the MacKenzies by Jennifer Ashley and the Bridgertons by Julia Quinn. I need to try this series! Oh, the Mackenzies are a great family! I don't really have a favorite family, although I do love the Bridgertons. This one sounds really good and I'd love to read it. I'm loving the Wildes and cannot wait to read Born to Be Wilde. There's no way I can choose one favorite fictional family. How about a top twelve--historicals only, in alphabetical order since I cannot possibly choose a favorite among favorites: Bedwyns (Balogh), Bridgertons (J, Quinn), Carsingtons (L. Chase), Chance Sisters (Gracie), Essex Sisters (E. James), Everseas and Redmonds (two families, one series, Long), Hathaways (Kleypas), MacKenzies (Ashley), Mallorens (Beverley), Merridew Sisters (Gracie), Wildes (E. James), Windhams (Burrowes). Choosing favorite contemporary families is even more difficult. I could do a top five for Nora Roberts alone: Concennons, MacGregors, MacKades, Quinns, Stanislaskis. I've also been enjoying the Cavenshams. Can't wait for the next one! I am a huge Eloisa James fan. One of her series I especially like is the Essex Sister series based on Shakespeare, closely followed by the Desperate Duchess series, especially the last two books in that series. But I loved her early work too, right from the get go, starting with the Pleasures series. So, yes, of course I read the first Wilde book right away. One of the Pleasures series features a man with migraines and it was so right on besides being a good book--and my son has killer migraines. I wrote EJ about it in those earlier days, and yes, she did have a friend with terrible migraines. She was so lovely as we discussed it back and forth She's a favorite person as well as a favorite author. Obvious, huh? I know, I know - I have to read this one. But I have to read the first one before, according to my daughter. It's on my summer reading list. I read too many books to name them all. I read all her books but I haven't started this series yet. But I'll be definitely reading it soon. So many wonderful families. The MacKenzies, Cynsters, Mallory's and Bridgestone to name some. I enjoy Eloisa's wonderful novels. Captivating and memorable. My favorite family is the the Hartes. So fascinating and intriguing. The Inghams and Swanns from Cavendon Hall are special and interest me greatly. Meant to stop by yesterday. I am wild for the Wildes. I have adored all the families included here, too! Can't wait to read this. One of my favorite families is Stephanie Laurens' Cynsters. Favorite family series: the Hathaways by Lisa Kleypas, the Bridgertons by Julia Quinn & Julie Anne Long's Everseas/Redmond family. JQ's Bridgertons are my favorite romance family. Can't wait to read this Wilde book! Thanks for the post and giveaway. The Bridgertons by Julia Quinn!! Jennifer Ashley's MacKenzies for me. I really need to get this series. I do have one of the early books in my TBR Mountain, but it sounds like I need to get the whole series and binge read it. The family I have read the most books in their series is Stephanie Laurens' Cynsters. Thank you for the review and the recommendation. Definitely another one for me to read.